These pictures and their explanations are by courtesy of Chris Kondur. Additional information on the Ely Dock junction was provided by David Ingham. This photo was taken May 1982. 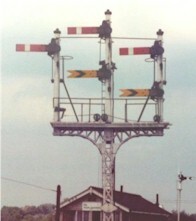 It shows the down branch section signal at Ely Dock Junction, Cambridgeshire. The distant signals under the main and right hand arms are for Ely North box, which is at the opposite end to the station. Behind the signal you can see Ely Dock Junction box. The white hexagon plate tells the driver that the track occupancy is displayed in the signal box, so he doesn't have to report immediately to the signalman in case of halting in front of a signal at danger. The yellow number "10" (note: see large picture) is a speed restriction, and the arrow indicated that it applies through the points that go to the right. Unfortunately the main line at Ely was electrified and resignalled in the 1980s, and now has colour light signals controlled mainly from Cambridge. This is a little to the north of the first photo, at the entrance to the station. Our train (note: see large picture) is standing on the down (northbound) main line, which stretches directly ahead. We are waiting for a departing London - Kings Lynn service to clear platform 1, after which we will make our call at the station. Just behind the departing train we can just see the roof of Ely North signal box and also the two signals which control departure from platform 1 (still clear for the departing train) and the down main line. 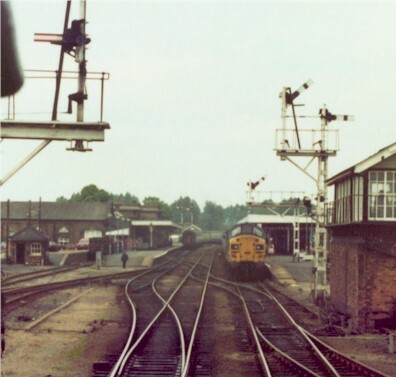 These are controlled by the North box To the right of the picture we can see a southbound Kings Lynn - London service, which is standing in platform 2, the up main line. Hidden by Ely South signal box is platform 3, which is normally used by trains taking the branch line to Ipswich. To the right of the box are (left to right): No.3 platform line, two sidings, and the goods avoiding line (allows freight trains to bypass the station). Ely South box controls all of the signals at the South end of the station. 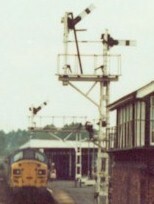 Note the typically Victorian over provision of signals on the up line - one to control departure from the platform, immediately followed by one that control the divergence of the Ipswich branch. Just above the cab of our locomotive you can see part of the signal gantry at which we are stopped. The small arm with the red and white stripes is a subsidiary signal, which allows a train to pass the main signal at danger in certain specially defined circumstances and proceed along the down main. If cleared, the little signal would show an illuminated letter "C" (black on white). "W" = "Warning": The line ahead is occupied immediately beyond the next signal. (Normally the signaller needs to have a defined clear margin beyond the next signal before he can clear the preceding signal). "S" = "Shunt ahead": pass the main signal at danger to make a shunting move. This is not an authority to proceed to the next signal. We will wait for the left main arm (out of picture), which will allow us to proceed into the platform loop. This photo was taken May 1982, and the scene here has changed considerably. 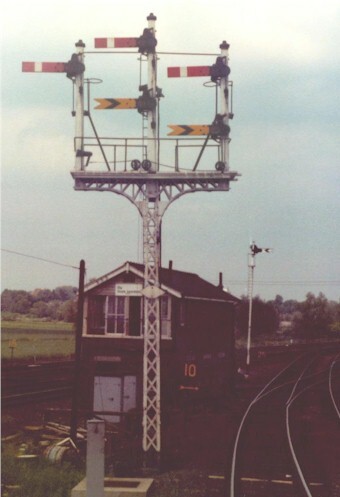 The line has been electrified, the London trains are now worked by electric multiple units, and all of the semaphore signals have been replaced by colour lights, which are controlled from Cambridge. Platform 1 has been extended outwards over the platform loop line and now faces onto the down main line. The down freight sidings on the extreme left have now been taken out, and the site is occupied by a supermarket.